This sterling silver squash blossom has 5 free form ovalish spiny and turquoise stones going up each size and 8 stones on the center naja. Side stones with blossoms measure approximately 1 3/4" to 2" wide by 1" long. Measurement of naja is 3 1/8" long by 3 1/2" wide. 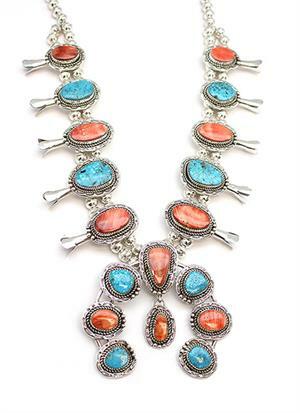 Total length of necklace is approximately 24" long. It is Navajo hand made by Ida McCrae and Navajo strung with 9mm machine seamed beads. Available in blue or light green turquoise shade. Choose color when ordering.